We have a great long term business relationship with Anjoli Salon & Spa. Over the years, we’ve designed, built and refined their website to meet their changing needs and to keep in step with emerging web technologies. We met with the owners of Anjoli Salon & Spa. Angie and Johnna had an idea of what they wanted their website to look like, at least what kind of feeling they wanted visitors to get, and what colors appealed to them. We sat together and created an elegant one-of-a-kind website design that they love. 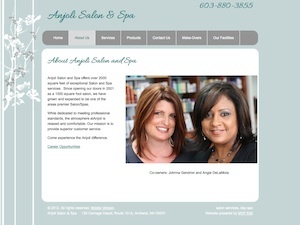 We built a custom content management system (CMS) that allows the staff of Anjoli Salon & Spa to quickly and easily update their website content. They can upload photos and resize them at the same time. We also created a “news” section that can be turned on and off as needed. While the Anjoli Salon & Spa staff can update their website themselves, they are often too busy. Or they need a little assistance remembering how to use the tools we built for them. We’re just a phone call away!